During the second half of the eighteenth century farming was modernised, and the result was an increase of productive power as important as that which was taking place in manufactures. The experiments on which the new methods were based were carried out in the first half of the century, but as news then travelled slowly and as farmers are usually conservative 1 in their practices, it was not until an increase in food prices occurred, especially during the great French war at the end of the century, that the new and rather expensive methods were at all widely adopted. The old English agricultural system was worked largely on a communal and co-operative basis. The village land suitable for growing crops consisted of three enormous "open fields", i.e. uninterrupted by hedges or fences. In each field many owners possessed scattered strips, which were ploughed, sown, and reaped by the village working as a unit, while the individual owners took the produce of their own strips. Anyone who lived in the parish could graze cattle on the village meadows when the hay had been made, or on one of the big fields which was resting fallow for the year. And. the woods and rough heath also were open to all the villagers, so that they could easily keep pigs, goats and poultry, and cut peat and timber. This system had its advantages in earlier times, but it was wasteful, and barely produced enough to feed the village. A good deal of arable land was wasted in the "open fields" by the grassy strips left to mark off the patches belonging to different owners, and the wide margins left round the field for the ploughman to turn his team of four to eight horses or oxen and the large clumsy wooden plough. 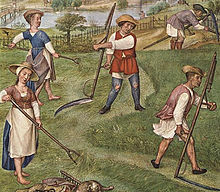 Much time too was wasted at the harvest in carting the crops from the widely scattered patches of any particular owner. Little was done to drain or improve the soil. The variety of crops was surprisingly small, as many of our familiar vegetables were not generally grown in England till the seventeenth and eighteenth centuries. As a rule a field would be used for wheat or rye one year, barley or oats the next, and would have to rest fallow the third year, as the soil was exhausted. Cattle and sheep were so small and bony that if we could see them to-day we should think they were freaks. As they all grazed on the same meadows, diseases spread rapidly. No cheap method was known of feeding them in winter, so that when the first frosts spoiled the grass, most of them were slaughtered and there was no fresh meat during the winter. The men who revolutionized English farming were Jethro Tull, Lord Townshend, Robert Bakewell, and Arthur Young who, besides making experiments on his own farm, toured England to explain the new methods. Tull had a farm on the bare downs of Berkshire. He thought that the old system of sowing seed by handfuls was irregular and wasteful. It was better to scratch a long groove in the ground and sprinkle a thin line of seed in it, and before long there were machines to do this. He insisted on the importance of hoeing, that is, breaking up the surface of the soiI thoroughly. He grew clover, which, besides providing a good food for cattle in autumn, enriches the soil of an exhausted field, and also turnips, which helped to solve the problem of a cheap winter food for cattle, and could be grown on a field that would otherwise have to lie fallow. Meanwhile, on the edge of the lonely salt marshes of west Norfolk, Lord Townshend, Walpole's brother-in-law and sometime colleague, had, on his retirement, devoted himself to the management of his estate. Where the coast marshes left off, there stretched inland vast sandy plains which could grow only patches of coarse grass. But Townshend discovered that marl, a limy clay which could be obtained from the marshes, supplied his sandy soil with just those elements necessary to make it productive. In time he had thousands of acres growing rich, nourishing grasses and turnips. His sheep and cows grew fat. The plains were divided up into fields by hedges so that the feeding of the cattle could be regulated. On the arable land a smaller and better plough of iron was used requiring only two horses. A "rotation of crops" was worked out, so that different elements of the soil should be drawn on each year. In addition, miles of marshland were drained, improved and made productive. And all the neighbouring farmers were invited to inspect and copy the new methods. In Leicestershire Robert Bakewell concentrated, with wonderful results, on improving the breed of cattle, sheep and horses, and as a result of his work, English stock is bought for breeding purposes in all the chief pastoral areas of the world. The improvements in English farming attracted attention all over Europe, and the pioneers had distinguished visitors and correspondents. But the new methods would have spread but slowly had it not been for the travels and writings of Arthur Young. He urged the adoption of the new methods on land already under cultivation, and drew attention to the enormous area of waste land, moor and marsh which could be made fertile. He also suggested that as the time-honoured "open-field" system did not favour experiments, there ought to be redistribution and enclosure. Young's propaganda was successful. He convinced many great landowners, including influential noblemen. The new farming caught the fancy of the fashionable world, and a literature of farming arose. As iron-workers became more skillful, farming was more and more mechanized, and by the end of the century steam threshers were at work. Once the work of the pioneers was appreciated, we can readily understand that the more enterprising and prosperous farmers in each parish were grimly determined to get the village lands rearranged in compact lots, separated by ditches and hedges, so that they might enjoy the full benefit of improved methods. Thus began the Enclosure Movement which was most vigorous from 1795 to 1815, though we must remember that there was no complete cessation of enclosure ever since the time of the Tudors. The earlier enclosure had been perpetrated in defiance of the law, But in the eighteenth century Parliament sympathised with the wealthier and more progressive farmer-landowners, and readily passed the private Acts which compelled the other landowners to submit to a rearrangement. If the owners of four-fifths of the parish agreed on enclosure, the government usually sanctioned it, however often the angry opponents tore down the notice from the parish church door. Commissioners and solicitors were then sent down to the village, who closely investigated the claims of each landowner and often rejected them if clear legal proofs were not forthcoming. They then redistributed every foot of land in the village that might be of any use, not merely the arable land but also wood, meadow and heath. So that when they published their map of the new holdings, practically every part of the village land became absolutely private property. All this was ruinous to the smaller owners and to those who had not owned any land but enjoyed access to "the commons". The commissioners and lawyers charged heavy fees running into hundreds, sometimes thousands of pounds, payable by the village. Then each holding had to be surrounded by a given date with a double fence till a hawthorn hedge could grow thick enough, and the other owners had to pay for the parson's double fence and hedge, which often put a further large sum on the bill. The penalty for failure to enclose was forfeiture of the holding to the richer owners. Those who fulfilled the conditions, adopted advanced methods on their new farms and grew prosperous, but thousands of owners of modest holdings had to sell them to pay their share of the expenses, or forfeited them because they could not legally prove ownership or afford to put up the fence. And together with their land, they usually lost also their hope and self-respect. Tenant-farmers whose landlords were anxious to regain their farms were charged stiff rents and otherwise encouraged to leave. Labourers also were badly hit by the enclosure of the commons, coming at a time when it was growing more difficult to eke out their livelihood by spinning and weaving. Those who were young and energetic went off to the towns and found work in the factories, or joined the army or navy, where brisk lads were needed after 1793. The others struggled along somehow, helped by doles from the parish poor rates. In 1800 Arthur Young was dismayed at the unforeseen results of his teaching. An old labourer complained to him: "All I know is, I once had a cow, and an Act of Parliament has taken it from me." The busy life of the old English countryside had received a fatal blow.